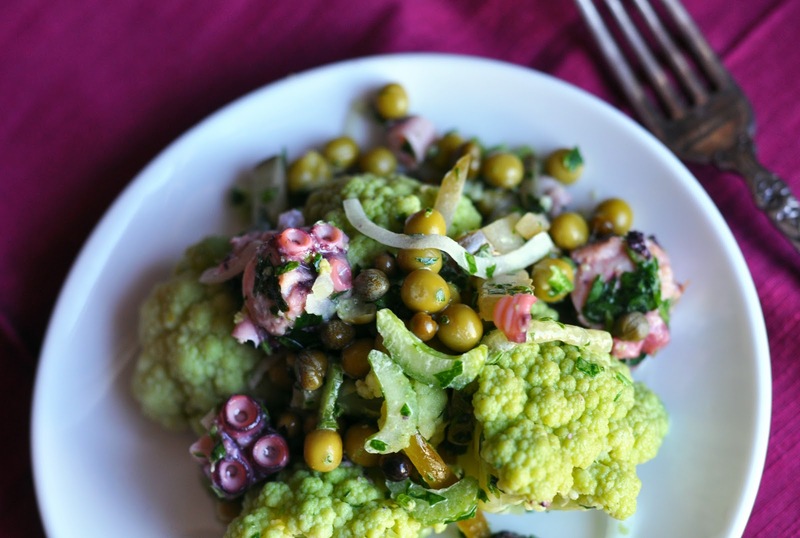 Perhaps due to this association, I suddenly craved some octopus amid a green paradise of green cauliflower, canned peas, pickles, celery, parsley, capers and a few other things. ...Wanna try? Carve the cauliflower into bite-sized pieces, and boil for no more than 5 minutes in a pot of salted water. Drain and rinse with cool water. Use a chopper to chop parsley very finely. In a small cup, combine mayo and soy sauce, mixing rapidly until homogeneous. You could also use oil for a dressing. Chop the octopus if necessary. Combine all ingredients in a bowl and tenderly mix in the mayo dressing. The point is to create a very thin coating of the dressing, so the small amount of mayo is intentional. Turn on some Beatles record. Sit down. Enjoy it. * I just discovered pickled green peppercorns. If you have these at your supermarket, I strongly recommend them. They are soft enough to chew, not as spicy as ripe dried peppercorns, but spicy enough to add a lot of character to your salads. Originally I was planning on using a hot pepper, but these worked much better.